Available only at The Container Store, our strong tubular metal Desk Legs are easy to attach to the underside of your choice of a Desk Top with the included screws. Combine the legs withElfa Desk Drawers, or a Bisley File Cabinet to create a customized desk that complements your personal style. Create a Custom Elfa Component Desk that's all your own: Design Your Own Component Desk. Desk Leg is rated 4.5 out of 5 by 12. 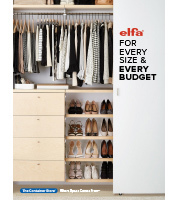 Rated 5 out of 5 by Love2BeOrganized from Elfa parts in use always mean success Elfa measurements allow individuals to plan out what will exactly fit their needs and puchase and easily assemble the parts to get just the result wanted. These white legs joined to an elfa white top and paired with an existing file cabinet made a perfect totally useful desk for a small footprint. When care is taken mixing and matching elfa parts, one is always successful. If you haven't used elfa, begin now! Rated 4 out of 5 by Cinnabon from Sturdy Legs I highly recommend purchasing the tubular metal desk legs. They are sturdy construction and do not wobble. Rated 3 out of 5 by Shilo from good product, bad online description The legs are sturdy and well designed. I ordered these legs on line and was disapponited when they arrived. From the photo and the description, it isn't easy to determine how many legs you are getting. At the very bottom, it says they are sold seperately. I was led to beleive they came in pairs. I was totally disappointed when they arrived because I didn't have everything I needed. Rated 5 out of 5 by Scotty1 from Love the Elfa Desk The legs for the Elfa Desk are very sturdy and wide enough to keep desk from tipping over when you lean on it. Although the holes are not pre-drilled on the desk, they were easy enough to drill myself. Rated 4 out of 5 by spacyej from Very sturdy and easy to install. The only downfall was that they are not sold as a pair and although the title is "Desk Leg," the image is a bit misleading, showing 2 legs. BUT, the Container Store's customer service more than made of for this confusion - shipping me another leg free of charge and I got it very quickly. Because of that experience, I am a repeat customer! Rated 5 out of 5 by bitbybit from Nice solid desk legs I bought two of these and combined with the desk drawers. I'm very pleased with the quality of both. Rated 5 out of 5 by Cheddar from Platinum legs are very nice Good looking and pretty easy to install. Used with a Driftwood Melamine desktop. Made for a nice, clean, simple desk. Can I purchase replacement screws from the store or order them online? Please contact our Customer Solutions Department at 1-800-733-3532 for replacement hardware for this item. Are casters available for these? Casters are not not available for our Desk Legs. Can the legs be cut down to make the desk lower ? The desk is pretty high if you work at it for long periods of time. I want to know if the the store will cut the legs down. No, our desk legs cannot be custom cut. Is there a leveler that comes with the leg to accommodate not so even flooring? No, the desk legs do not include levelers. Instead, we would recommend our Wobble Wedges (sold below). What is the weight capacity of legs? While we do not have a set weight capacity for our elfa Desk and Desk Legs, they are designed to hold mid-weight items such as a computer monitor, computer tower, printer, and other common office supplies when properly installed. What type and length of mounting screw is included? they are 3/4&quot; wood screws. Three come with each leg that's purchased.